Last month I presented our approach for automatically generating mobile navigation design models from web-based analytics data. The approach mines usage data of a website, builds a model of the web usage patterns coming from both web and mobile-specific usage sessions, transforms it into a mobile-oriented navigation tree, and generates a mobile-oriented navigation model, usable by interaction designers. Such a generation is totally automatic and amounts to solve a variant of the Steiner Tree problem with revenues, budget and hop constraints (thanks for prof. Fabrizio Rossi for his precious help here!). Here is the abstract of our paper. Today activity on smartphones and tablets accounts for an incredible 60% of the time spent on digital media in the United States. People will rely more and more on mobile devices for performing very different activities like purchasing products, messaging, ordering food, booking holidays, etc. Nowadays, a common technological trait is that browsing even a responsive website on a device can be “uncomfortable” and always more often a dedicated mobile app is introduced from an existing website. However, the navigation design of a mobile app can be totally different from the one of a website due to many factors such as display size, different physical and modal contexts, etc. Therefore, developers cannot simply replicate the navigation design of a website into the corresponding mobile app, but a complete redesign is needed. 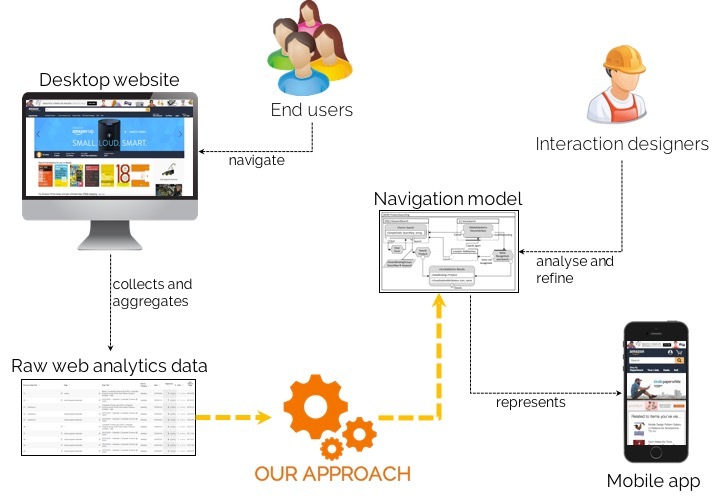 In this paper we present an approach for leveraging web analytics for automatically generating mobile navigation design models. The approach mines usage data of a website, builds a model of the web usage patterns coming from both web and mobile-specific usage sessions, transforms it into a mobile- oriented navigation tree, and generates a mobile-oriented navigation model, usable by interaction designers. Such a generation is totally automated and amounts to solve a variant of the Steiner Tree problem with revenues, budget and hop constraints. The feasibility of the proposed approach has been evaluated on an existing institutional website.